THE prosecution has opposed former Information, Communication Technology and Cyber Security Minister Supa Mandiwanzira’s application for exception, saying it lacks merit. The Nyanga South National Assembly member is facing criminal abuse of office charges after he engaged Megawatt Company to do consultancy work for NetOne without going to tender, before directing NetOne to pay $4 million to the company. In his application last week, Mandiwanzira argued that he did not act criminally when he engaged Megawatt Company to do consultancy work for NetOne. The former minister also gave notice to apply for temporary release of his passport, which the State was opposing. 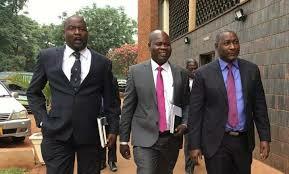 However in response, the prosecution represented by Messrs Michael Chakandida and Tapiwa Godzi said the application for exception was meant to delay court proceedings. “The application was made to delay finalisation of this case where the State case is strong. “Accused is trying by any means to delay or stop commencement of trial and at the same time making efforts to regain his passport held by the clerk of court through the variation of bail conditions,” the State responded. Mandiwanzira said Megawatt was engaged on a pro bono basis, but the prosecution said he pressured NetOne to pay $4 000 000 for the services rendered. “Letters of demand were directed to NetOne by Megawatt Company. “Again no procurement procedures were followed, no written contract was recorded, the potential prejudice suffered by the State shows that this is a case where procurement procedures were flawed,” reads part of the State’s response. He also submitted that NetOne Cellular (Pvt) Ltd was not a procurement entity which had to comply with State procurement regulations. “Accused does not deny allegations against him, but rather raises a defence that NetOne was not a procuring entity. “Assuming that his version is true, could he as a public officer be allowed to act in the manner he did to NetOne. The answer is no. “It is pertinent to observe that the application is not only misleading, but also bad at law. “His legal practitioners in so asserting that NetOne is not a procurement entity, are ignorant of the law. “The definition of a legal entity which the defence is proffering is certainly in the narrow sense, with no reference to other useful pieces of legislation,” argued the prosecution. He made an exception application to the first count and would plead to the second count after the determination of his application.